It has been an incredibly busy spring for NEXUS members. After our March and April residencies in Houston TX and Potsdam NY, June 5 took us into Reich, Rhythm and Repetition” Symposium in Toronto. Russell has been on tour with the Toronto Symphony Orchestra in Europe, and then adjudicated the Modern Snare Drum Competition at the Cleveland Institute of Music. Coming up for him are guest artist appearances at Nief-Norf Summer Festival and at the The Sixth International Conference on Music and Minimalism hosted by the University of Tennessee and Nief-Norf. Both take place in Knoxville, TN. From there, he heads to the Chosen Vale Center for Advanced Musical Studies in New Hampshire, where he will be on faculty for the summer Percussion Seminar, and then to Princeton as a guest artist for SoPercussion’s Summer Institute. Perpetual motion!! In April and May, Garry presented a series of sessions for the Lifetime Learning Institute of Bard College called “Good Vibrations: A Life of Harmony” expanding on his TEDx Talk of the same name. (If you missed it, you can listen to it here.) Always active in his home community, at the end of May he presented a Leadership class for the Ulster Leadership Development Institute (Ulster County Regional Chamber of Commerce). He too will be a guest artist for SoPercussion’s Summer Institute, but first, coming up this month he will be playing timpani in a concert of orchestra jazz repertoire with the Northern Dutchess Symphony Orchestra. Here’s an interesting twist: they will be juxtaposing Ellington’s jazz interpretation of The Nutcracker Suite (arranged for the NDSO by Jeff Tyzik), with the original Nutcracker by Tchaikovsky! June 17, 7:30 in Rhinebeck — Be there, or be square! Bill has been busy – writing! He has two new books on the go, and he promises to tell us more in due time. Both will doubtless be useful AND entertaining. Coming up in July he will be facilitating six Creative Music Making sessions and a concert for the Eastman School of Music’s Summer Horizons program for international high school students. Bob has been writing too, and has two new compositions in the works, with strings, voice and clarinets added to the mix. He has also been developing some very interesting repertoire for marimba, xylophone and drum set in his collaboration with his Japanese colleague Yurika Kimura. 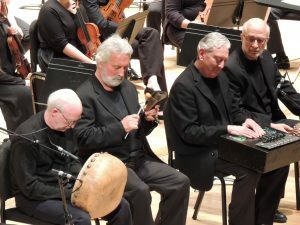 In April they performed with Peter Erskine at Concordia College in Moorhead MN for the College’s Day of Percussion, and Bob will keep us apprised of upcoming plans. And of course, as mentioned in previous posts, Bill and Ruth Cahn were both honoured by the Rochester Youth Philharmonic Orchestra for their extensive work in music education in Rochester, and Russell Hartenberger received the wonderful news of his receipt of the Leonardo da Vinci World Award of Arts from the World Cultural Council. You can read the WCC’s announcement and profile of Russell here. Stay tuned for our summer concert and recording news, when we try to get everyone in one place for a few moments!